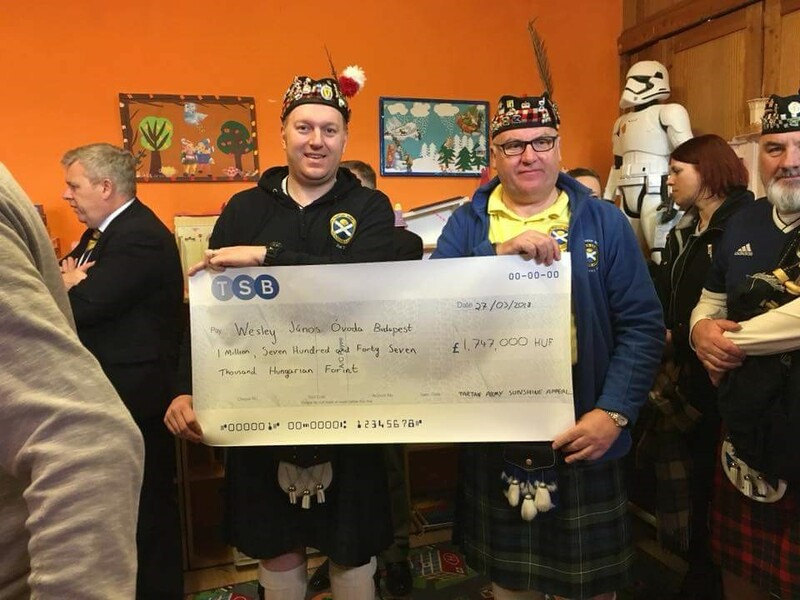 When I joined the Tartan Army Sunshine Appeal Steering Group, I was looking forward to getting the chance to arrange one of the donations, and in late 2017 when rumours started about a friendly in Morocco for March 2018, my hand was straight up to organise it. The Morocco game never materialised, and we found ourselves getting a friendly against Hungary in Budapest instead. This should have proved easier, but was surprisingly hard to find a suitable recipient who would meet our criteria (the Hungarian Government seem to be really clamping down on local charities, with most the ones I found being located and run in the UK), so I contacted Matyas Szeli through social media, a Hungarian football reporter for Nemzeti Sport, the biggest Sports newspaper in Hungary. He pointed me in the direction of the UK Ambassador, Iain Lindsay (himself a Scot), and a local ex-pat called Patrick McMenamin (whose name came up a lot when asking locals for some advice), having lived in Budapest for many years (as owner of the Caledonian Pub in the city, which a number of the Tartan Army visited around the Serbia game many years ago) and also just happened to be very active on the Hungarian charity scene along with his business partner Zsuzsanna Bozo. All three (along with fellow ex-pats, Douglas Arnott from Robert Burns International Foundation and Duncan Graham from the St Andrews Association) were more than helpful, and pointed us in the direction of Dankó Street Nursery, which is a child’s nursery/kindergarten that looks after 40 kids (aged 4-12 years), located in one of the poorest parts of Budapest (8th district). Having so many feet on the ground in Budapest made this such an easy donation for us, and the day of the donation went so smooth and like clockwork. 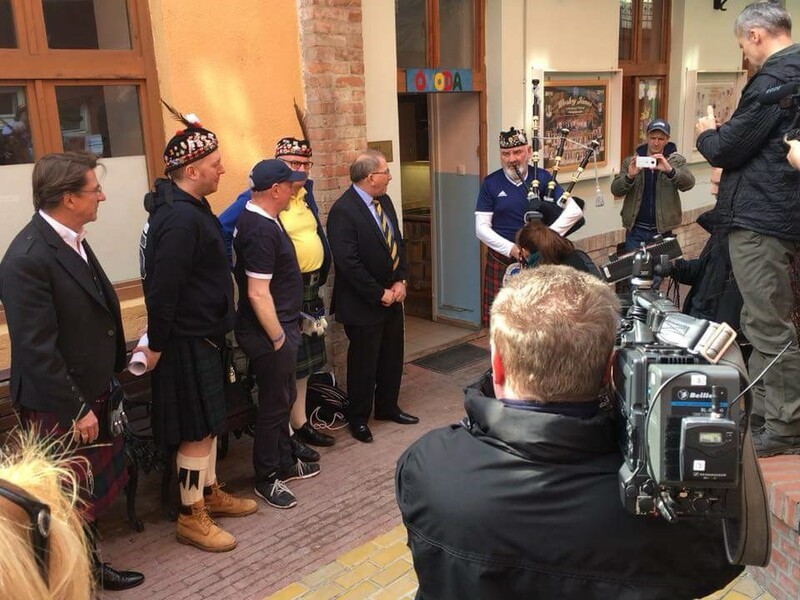 We arrived at the nursery, where we were greeted by Ambassador Lindsay, Judit Danada, the Head of the Sports Department from the Budapest Mayors office, the local media and as well as a pleasant surprise to have SFA president Alan McRae, and the interim chief executive Andrew McKinlay also present. After this we were introduced to Iványi Gábor, the founder of the nursery, and Lónyai Zsuzsa, who runs the nursery, with an introduction about the goings on and history of the nursery. 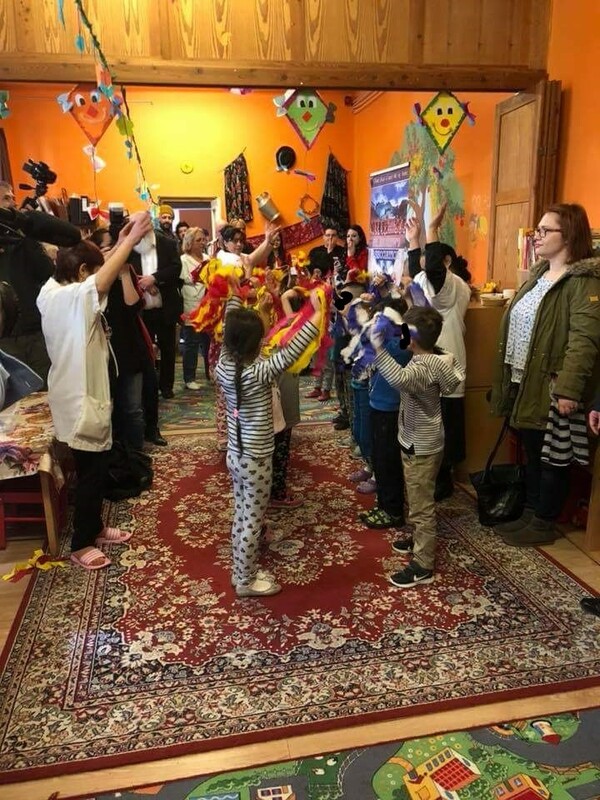 After the presentation we were entertained with a performance from the children, with a mixture of dances, songs and then some traditional gypsy dancing, with most the 4-7 year old kids having feet work that made Michael Flatley look like a beginner. NOTE: Due to the nature of the background of a lot of these kids, we have had to blank their faces to protect them from being recognized, as a number of them come from families that face a multitude of social issues. 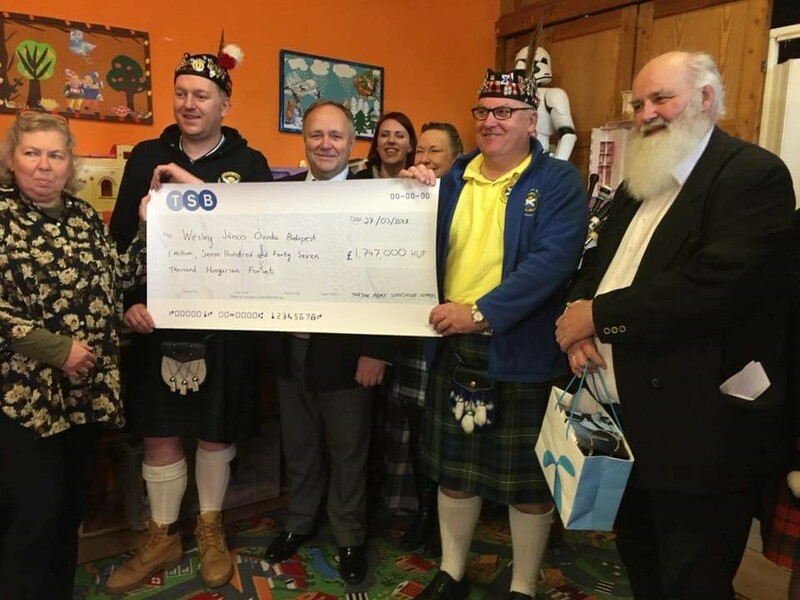 Once the formalities of interviews to the local press and media were out the way, we said our goodbyes and Pat took us to a bar where were got to know more about his work in Hungary, and just what the nursery means to him. After this we went our separate ways to head to various pubs to get some pre-match beers and onwards to watch a Scottish victory over our Hungarian hosts. Next day was waking up to an explosion of local media interest and locals thanking us on social media and even on the streets when we walked past. In the morning I was doing a walking tour of the Jewish district, and the first thing the guide asked me “are you the guy in the photos in all the papers today?” and suddenly was a local celebrity, as she went into a shop to buy a newspaper and came out and made me pose for photos with the page open which discussed the donation. It was clear that this small donation meant an awful lot to the Hungarians, but to me the whole day was summed up during the performance from the kids when I looked across to the media people, and noticed a cameraman, who looked like he was a member of the Hungarian 1980 Olympic Games shot putting team, move the camera away from his face, and start to wipe away the tears from his eyes. With that one moment I knew how much of a difference we had really made.